Polly Howells is a member of the Rural America In These Times Board of Editors, and a semi-retired psychotherapist who splits her time between Woodstock and Brooklyn, New York. Polly Howells is a member of the Rural America In These Times Board of Editors. 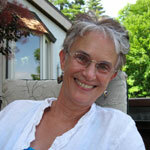 Polly is a semi-retired psychotherapist who splits her time between Woodstock and Brooklyn, New York. She is a founding member of Woodstock NY Transition, a board member of Bioneers and Radical Joy for Hard Times, and a facilitator of the Pachamama Alliance’s “Awakening the Dreamer Changing the Dream” Symposium. She also co-leads a yearly 5-day residential workshop for women, “Reclaiming our Lives, Reclaiming our Earth,” incorporating the work of Jungian analyst Marion Woodman, with whom she trained. Her two great-grandfathers were Midwestern literary figures, Ohio-born novelist William Dean Howells (1837-1920) and Chicago Tribune editor-in-chief (1864-1874) Horace White (1834-1916). Don’t Frack with Our Water!